The Naperville Art League proudly announces the 32nd Annual Riverwalk Fine Art Fair. We invite you to attend our juried art exhibition and sale, which is held along the renowned Naperville Riverwalk and downtown city streets. The Riverwalk, considered to be one of the most beautifully maintained park grounds in the Midwest, is a delightful setting for a Fine Art Fair. On the third weekend in September we add to the ambiance with an outstanding display of the finest in visual arts. 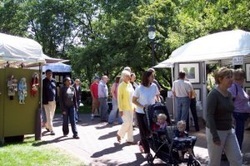 The Riverwalk Fine Art Fair is held on Main and Jackson and along Naperville's Riverwalk, in the center of a sophisticated, art conscious community. The public is invited to experience an explosion of artwork from some of the country's best artists. Take the I-88 WEST/E-W TOLLWAY ramp towards AURORA. Merge onto E WEST TOLLWAY/I-88 W (Portions toll). Take the NAPERVILLE RD exit. Turn RIGHT onto NAPERVILLE RD. NAPERVILLE RD becomes N NAPER BLVD/N NAPERVILLE RD. Turn RIGHT onto N NAPERVILLE RD. Turn RIGHT onto E OGDEN AVE/US-34. Turn LEFT onto N WASHINGTON ST. When you reach downtown NAPERVILLE, proceed to Main Street [1 block West] and Jackson then along the Riverwalk. Get Yahoo driving directions from your location. To enter, simply complete the application process online at Zapplication.org and submit a non-refundable payment of $35 for the jury fee, $65 if applying after the deadline of March 28 and before April 4, 2017. No applications will be accepted after April 4, 2017. Participation is open to artists working in painting (acrylic, oil, water media), drawing, sculpture, fiber, graphics, mixed media, jewelry, photography, pottery, metalwork, glass, wood, digital art and enamel. We seek to maintain the highest standards for both artist and the viewing public. We enforce an “ORIGINALS ONLY” policy. No copies, kits, signed offset, laser, ink jet, giclee or photocopied reproductions, commercially made products, fabricated forms or settings in lapidary work will be accepted. Exceptions are made for those applying under the heading of Printmaking wherein prints must be produced by the artist using printmaking techniques and in Photography and Digital Art where prints must be printed by the creator, signed and numbered. Artist must be present for the duration of the show. The Riverwalk Fine Art Fair is annually on the third weekend of September. The next show will be held on September 16 and 17, 2017. We are open to the public from 10 a.m. to 5 p.m. on both days. Optional setup will be available on Friday, September 15, 2017 from noon on. Booth Fees are $450. Payment must be received from invited artists by June 15, 2017 to ensure participation in the show. All payments are to be made directly to the Naperville Art League and not through the Zapp system. Checks, made payable to the Naperville Art League should be sent to the Naperville Art League, 508 North Center Street, Naperville, IL 60563. Submitted images must be representative of the work to be exhibited and should be sharply focused. All 5 images will be simultaneously projected and juried by professional art experts. Artists will be ranked numerically in their category based on jury scores. Exhibitors are selected by ranked point total. A brief artist statement may be read while your slides are being projected. Booth fees are $400 for a single booth. Notification of status will sent by May 15, 2017 Due to unexpected circumstances which occur every year, the director may be involved in artist selection after the jurying process. Artists must include a brief statement about their materials and how they are used in the application form. This statement may be read aloud while their slides are being projected. Standard booth size is 10 X 12. Booths run along the Riverwalk and adjacent downtown city streets. Exhibit areas have both sun and shade and possible uneven terrain. Some booths are on the grass and others will be on the street or brick walkway. Tents are required. Tents must be weighted down and not staked into the ground. Artists must provide their own tents, display boards, tables, chairs, etc. Booths will be assigned by show management to provide media variation throughout the show. One Best of Show with a $1000 cash prize will be awarded. Ten first place ribbons will be awarded with a cash prize of $250 each. Up to five honorable mention ribbons with a $100 cash prize will be awarded. Ribbons are awarded where excellence is determined regardless of media categories. Numerous purchase awards will be available. Naperville is located 30 miles west of Chicago, Illinois in affluent DuPage County. Known for its nationally-acclaimed schools and library system, Naperville is consistently recognized as a top community in the United States in which to raise children or retire. In December of 2003, Naperville earned the top honor in Money Magazine’s “Best Places to Live” rankings. Home to over 140,000 citizens, Naperville is a booming suburb with a concentration of high tech firms. The most recently recorded estimated median family income was $95,000.The community works hard to maintain its small town character. The quaint downtown area is populated by several national retail chains, small shops, and several fine restaurants making it a favorite destination of area shoppers. For more information about the City of Naperville, area events and attractions visit the Naperville Visitors and Convention Bureau web site at www.visitnaperville.com or call toll-free at 1-877-23NAPER. The Riverwalk Fine Art Fair is sponsored by the Naperville Art League and professionally directed and produced by Debbie Venezia. 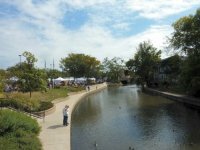 The expressed intent of the Naperville Art League is to keep the Riverwalk Fine Art Fair a high quality yet intimate art fair. We make every effort to prevent the loss or damage of artwork, however, Debbie Venezia and/or The Naperville Art League, is not responsible for such occurrences. We reserve the right to alter details associated with The Riverwalk Fine Art Fair. Accepted artists wishing to cancel must notify Debbie Venezia at the Naperville Art League in writing by July 31, 2017 in order to get a refund (minus a $50.00 handling fee). NO refunds will be given after that date. The 2017 Riverwalk Fine Art Fair will be held on Jackson between Main and Eagle and along Naperville's Riverwalk on Saturday & Sunday, September 16 & 17 from 10 am to 5 pm. Set Up: Friday, September 15 from 11 am until ? at the Naperville Riverwalk, Jackson and Main, Naperville, Illinois. Admission and parking for the Riverwalk Fine Art Fair is free. Parking is available on most of the side streets north of W Jackson Ave, in the Park District lot on W Jackson, in Centennial Park. There are two city parking garages in easy walking distance from the Fair, one across located east of Washington Street, entering from E Chicago Ave or E Jefferson and the other west of Washington Street on W Benton or W Van Buren. disabilities. The area is located in the Riverview Parking lot, accessible off of Webster Street, just south of Jefferson Avenue. Signs will be posted off of Webster Street to direct patrons to the zone. Following is a map (pdf) indicating the location of the drop off and pick up zone. " In 1986, Bruno Botorelli, developer of Riverwalk Apartments, Dr. Jonathan Croll, then president of the Naperville Art League and Dee Pasternak, League Publicity Chairman initiated the Riverwalk Fine Art Fair (RFAF). Since it was the 100th anniversary of Georges Seurat’s Sunday Afternoon in the Park, the committee decided stage a live reenactment of the work at Naperville’s quarry (now Centennial Beach). Many photos were taken and the RFAF earned international recognition through the AP wire service. The inaugural Fair, a juried event, hosted 130 artists. To distinguish itself among other shows, the RFAF developed a theme around famous art and artists for the first twelve years. One year the Riverwalk was covered with soft-sculpture people such as Henri de Toulouse-Lautrec with one of his models, a mermaid and a bag lady bearing a sign asking for support of the Great American Garage Sale. Another year, the League floated hula-hoop water lilies in the quarry to emulate Claude Monet’s well-known work. The Fair has continued annually each fall and has retained recognition as one of the best art fairs in the United States.